What is the importance of zoos and aquariums? Why bother keeping animals under human care? How could some animals actually benefit from living under the care of licensed animal caretakers? My answers to these questions formed as I gained real-world experience with working animals under human care. Everything shared here is based on things I have learned or observed through these experiences in animal care organizations, as well as often my own interpretation of these experiences. While in high school, I watched the films “Blackfish” and “The Cove” multiple times, learning about animals in captivity and the poor treatment of animals in some facilities. This is the viewpoint of many “animal rights activists”–that animal captivity equates to animal abuse. I was one such “activist,” assuming that all zoos and aquariums were cruel facilities, no better than a prison for so many innocent creatures. I’d repost various articles, videos, and photos from animal rights groups on social media, captioning that these “cute” behaviors exhibited by the animals aren’t cute at all but are examples of phenomena like zoochosis, the display of repetitive and unnatural behavior by an animal under human care, indicative of psychological stress on the animal. However, my opinion began to change when I took Ethics and Animal Welfare, one of my first college courses. As a part of the curriculum, we visited Big Cat Rescue in Tampa, Fla., where we had the chance to observe how these animals benefited from being under licensed human care, rather than their prior environment. We learned about how most of the animals there were rescued from abusive or unnatural environments; some, originally bought as pets, were abused or abandoned, while others were made performance cats — most of which had been living under actual captivity their entire lives. Almost all of the cats there — lions, tigers, panthers, jaguars, etc. — were ineligible for release into the wild, but were thriving and seemingly content under human care at this organization. One of the biggest catalysts to shifting my opinion of animal wellbeing under human care was a guest presentation in my Comparative Psychology class in spring 2018. A zookeeper from the African Animals exhibit at ZooTampa spoke to our class about the elephant habitat, the animals the zoo cares for, and how many people complain the elephants “don’t have enough space.” However, her argument showed these people are woefully misinformed. She explained how the animals have the correct amount of calculated space for all of the individuals as needed for a living environment that has no predators and readily available food and water; if given more space, it would not be utilized, as it is not needed. Currently there are 233 accredited U.S. institutions within the Association of Zoos and Aquariums (AZA), which “collectively draw more than 195 million visitors every year,” according to their website. A common element of environmental issues is the difficulty to care about something if it can’t be seen or isn’t understood. AZA organizations allow for up-close observation and education of exotic species that most people otherwise would never see in their lifetimes. Many people have a hard time caring about issues like climate change, sea level rise, species extinction, etc., because they can’t be seen with their own eyes. Many AZA organizations offer interactive programs, which can not only expose people to conservation issues, but provide an opportunity to appease individual desires to interact with exotic species, which is generally otherwise illegal. AZA organizations also have standards they have to meet or exceed in several areas of operation, including animal welfare, veterinary care, education, conservation, physical facilities, and many others. These rigorous standards ensure that AZA accredited facilities are focused on many key aspects, the most important of which being the care and well-being of the animals. In addition to AZA-accredited facilities, there also are 73 Alliance of Marine Mammal Parks and Aquariums (AMMPA) organizations worldwide. 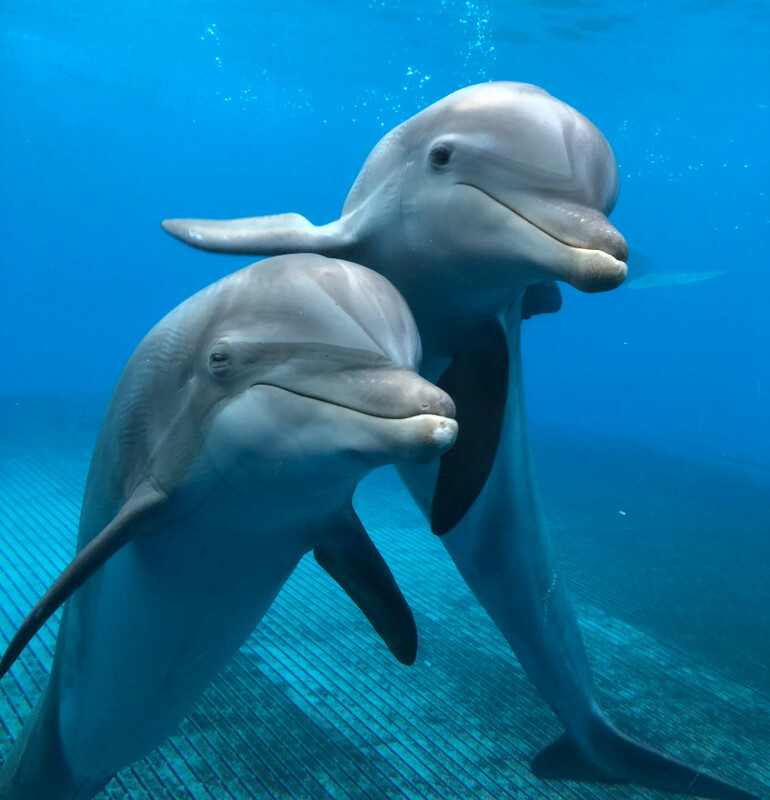 Of these 73 organizations, 27 are accredited U.S. facilities, many of which focus on dolphin and marine mammal conservation. AMMPA accreditation requirements include a quality of care that meets or exceeds rigorous regulations, including standards similar to those required of AZA organizations. Marineland Dolphin Adventure (St. Augustine, Fla.) is an accredited AMMPA facility and is an interactive educational facility. Originally established in 1938 as Marine Studios, MDA now specializes in conservation. As a former intern, I learned the proper phraseology to use when referring to various aspects of an animal care facility. For example, they taught me that while the word “captivity” is undescriptive and controversial. “Human care” is a better way to describe the way in which the animals are handled. The animals are not imprisoned; most often they are living in safe and enriching environments, looked after by people who deeply care for them. Furthermore, saying “captivity” silently supports the negative attitude toward caring for animals in these facilities. Other terminology changes suggested during my internship included alternatives such as “habitat” instead of “tank” and “preferred” rather than “good/bad” in reference to behaviors. Changing one’s word choice helps promote a more neutral connotation toward professional animal care institutions. Often, language used by many “anti captivity” movements consists of word choice geared toward framing these organizations in a negative perspective. “Captivity,” “suffering,” “exploited,” and “slavery,” are just a few terms used by the Empty the Tanks movement to describe organizations that keep cetaceans under human care. These words make the practices of all zoos and aquariums seem corrupt, but this is untrue. My personal experiences in the field have shown me that what these movements view to be negative practices are actually carefullyplanned functions and interactions that benefit the well-being of the participating animals. In addition to caring for more than 800,000 animals collectively, the AZA also has a program that helps protect threatened and endangered species, many which do not reside under human care. S.A.F.E. (Saving Animals From Extinction) uses conservation action, public education, and expert wildlife care to make an effort in preserving species on the brink of extinction. Currently, there are nine species/groups of species on the AZA S.A.F.E species list, with conservation efforts underway to help improve their status on the IUCN red list. Additionally, 33 species are currently listed as Extinct in the Wild; AZA efforts have successfully conducted the introduction of captive-bred organisms into the wild to improve conservation status, resulting in the improvement of 3 species, brought back from wild extinction. These species include the Przewalski's horse, black-footed ferret, and California condor. This shows that, if raised for this purpose, animals can be properly released into the wild after residing under human care. Furthermore, animal care requires some amount of animal training in order to conduct proper care, and these taught behaviors are completely voluntary. These are the most basic of behaviors, allowing for a trainer or zookeeper to perform daily care rituals. Behaviors like presenting a body part or limb, specific movement, participation in blood taking or hydration sessions, and anything else that may not be a natural behavior for the animal but assists with proper care are referred to in the animal care community as “husbandry” behaviors. However, during my time at Marineland, I observed dolphins outright refuse to do a requested behavior, and the trainers respect this. In addition, the dolphins aren’t requested to do any behavior that isn’t naturally displayed by wild Atlantic Bottlenose Dolphin. Many believe animals of particularly high cognitive ability can only be happy in the wild instead of human care, but this is a myth. It isn’t psychologically possible for animals born under human care to miss a life in the wild because they have no knowledge of it, nor is it an argument of “intrinsic knowledge” or evolution. Additionally, it’s common understanding that a dolphin cannot suddenly be placed in the ocean if it has never had to hunt or evade predators, nor been exposed to toxins and bacteria that exist in the ocean. Nevertheless, I’m expressly aware that the system is not perfect and that there are zoos and aquariums with practices that aren’t exactly stellar. Many nonaccredited facilities don’t have the same rigorous standards required of AZA and AMMPA organizations, proving that indeed the practices of some facilities may not be entirely focused on animal welfare. However, my argument lies within the purpose and benefits of the concept of zoos and aquariums, and within the ideal world that all animal care facilities would operate at the highest standard possible. I am aware that this is not always the case, but the original idea isn’t corrupt. While many places originally were based on entertainment, and many still rely on it, there has been an increasingly popular transition into direct education through observation and interaction. Experiential education has, time and time again, been proven to be one of the most effective methods of education. People connect with and care more about things they can outright see and experience.